This popup book contains several interactive electronic elements. It’s the creation of [Antonella Nonnis] using mostly scrap materials she had on hand. Of course there are some familiar players behind the scenes that take care of the electronic elements. Her photo album of the build process sheds light on how she pulled everything together. 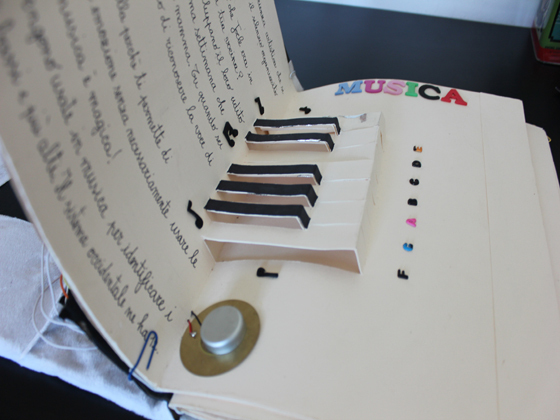 Instead of adding switches for interactivity she built capacitive touch sensors on the backs of the pages. Strips of copper foil serve as flexibly traces, moving the connections past the binding and allowing them to be jumpered to the pair of Arduino boards which control the show. That’s right, there’s two of them. One is dedicated to running the pop-up piano keyboard seen above. The other deals with Art, Math, and Science elements on other pages. This continues some of the multimedia work we saw popping up in popups a few years back. Very cool and practical. I hope to see it in greeting cards! F to F? Anachronistic handwriting? Could have used 3 more coloured breadboards.